Manchester United midfielder Marouane Fellaini genuinely hit such a bad shot against Liverpool that it ended up behind the corner flag and knocked a steward off their seat. Watch the video below and see for yourselves, with the Belgium international really summing up how desperate this United side is right now. While Paul Pogba has certainly not been at his best in a United shirt, one has to wonder how long Fellaini can continue to keep him out if he plays like this. 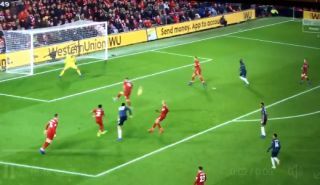 Pogba may be flawed, but you’d back him to at least hit a better shot from that kind of position – one to trouble goalkeepers, not matchday staff!